The Supreme Court has listed 26 November 2013 as the next of hearing in the matter of 12 digit biometric unique identification (UID)/ Aadhaar number project. The Court in its order dated 23 September 2013 directed, “In the meanwhile, no person should suffer for not getting the Aadhaar card in spite of the fact that some authority had issued a circular making it mandatory”. But in manifest contempt of court, states like Jharkhand, Mizoram and others are making it mandatory. After Court’s order, Jharkhand Government issued an appeal in all the newspapers in October 2013 making Aadhaar number mandatory for all the students in the state. The appeal is attached. Hopefully, the Supreme Court will take these states to task. A Dalit activist who was one of the first 17 eminent citizens who issued the Statement of Concern against UID at a Press Conference at Press Club of India in New Delhi on 28 September 2010 said, "This project wants to fix our identities through time. Even after that we are dead. The information held about us will be fixed to us by the UID number. Changing an identity will become impossible. We are working for the eradication of the practice of manual scavenging, for rehabilitation of those who have been engaged in manual scavenging, and then leaving behind that tag of manual scavenger. How can we accept a system that does not allow us to shed that identity and move on? How can a number that links up databases be good for us?" But be it Bahujan Samaj Party (BSP), or Samajwadi Party (SP) or Dravida Munnettra Kazhagam (DMK) or Janata Dal (United) (JD-U), they are busy endorsing or implementing the questionable project. In a late but significant development, West Bengal chief minister Mamata Banerjee on 1 November 2013 urged the central government to "seriously reconsider" its decision to make Aadhaar compulsory for getting subsidised cooking gas (LPG). She said, "There is a Supreme Court verdict that Aadhaar cannot be made compulsory for getting benefits of government schemes. The government appealed against it, but the SC rejected it. Even then, how can the petroleum ministry decide that without Aadhaar people won't get the subsidy of nine cylinders?" "I request the prime minister to take care or our party workers will lay siege to the Indian Oil Corporation office. It is an ‘attempt to cheat the people’…I am shocked to see this attitude. People are not beggars, why are they the sufferers?” she added. She also criticised central government agencies for ‘harassing people’. Memorandum of understanding (MoU) to implement UID/Aadhaar was signed with Unique Identification Authority of India (UIDAI) when Communist Party of India (Marxist)—CPI(M) was in power in West Bengal. In effect, both Trinamool Congress (TMC) of Mamata Banerjee and CPI (M) seem to have similar position on Aadhaar. Earlier, on 29 September 2013, Tamil Nadu chief minister J Jayalalithaa wrote a letter to Prime Minister Manmohan Singh to stop the linking of cooking gas subsidy to the Aadhaar number. The chief minister highlighted the need for the states to be consulted before launch of any ambitious scheme if the central government’s intention is to ensure efficient delivery. She said, “The State government is strongly opposed to the proposed rollout”. She argued that LPG, an essential commodity, is to be made available to the users in a timely and need-based manner. Replacing the subsidy with a direct cash transfer is not appropriate. Sadly, legal minds in West Bengal and Tamil Nadu have not informed these chief ministers that it is not a question of being voluntary or mandatory. It is a question of the grave ramifications of illegal and illegitimate biometric Aadhaar number which is quite well documented. Kerala’s leader of the opposition VS Achuthanandan from CPI (M) has asked the government to drop the ‘Aadhaar' project on 26 August 2011. He noted that fingerprints and other biometric information of citizens were being collected under the project violated provisions of the Citizenship Act of 1955 and Citizenship Rules of 2003, neither of which permitted collection of biometric information of Indian citizens. The state government, which was pushing ahead with the project in Kerala, appeared little worried about the serious concerns being expressed the world over about the implications of the UID project for citizen's right to privacy and security. It must be noted that Achuthanandan as the chief minister of Kerala, launched the unique identification number project, Aadhaar in the State on 24 February 2011. In his inaugural speech he has said that Aadhaar project has elicited mixed feelings within the minds of people. “As we launch this project in the State, we will take necessary measures to spread awareness of the pros and cons of enrolling into this scheme before people enrol themselves,” Achuthanandan had said. But enrolment for the UID/Aadhaar had begun with immediate effect during his tenure. Wisdom seems to dawn when politicians are in opposition, now he has rightly demanded scrapping of Aadhaar. But in Tripura, where CPI (M) rules, this belated wisdom seems to await the time when chief minister Manik Sarkar will be in opposition. Tripura was the first state in the northeast and the eighth in India where the Aadhaar scheme was launched on 2 December 2010. Tripura secured top position in the country in implementing Aadhaar project. But this performance is shrouded with allegations of irregularities in spending of Rs15 crore meant for Aadhaar. Bowing to the Congress party's persistent demands, chief minister Sarkar announced in the state assembly on 1 March 2012 that the state government would request the Central Bureau of Investigation (CBI) to investigate alleged irregularities in implementation of the 12-digit number being issued by the UIDAI for all Indian residents. "We would take up the matter with the CBI and the Comptroller and Auditor General of India (CAG) to examine whether any misdeeds occurred in spending the central funds meant for 'Aadhaar' scheme," he said. Tripura’s rural development minister Jitendra Chowdhury quoted a communiqué of the union rural development ministry in the state assembly saying, "The central government, at a function in New Delhi recently awarded Tripura and other well performing states in implementation of the Aadhaar scheme." One does not know whether the demand for CBI probe has been pursued. CPI (M)’s position on Aadhaar/UID that has been articulated so far appears to be exactly the same which has been voiced by TMC and Bharatiya Janata Party (BJP) despite their sharp differences on the issue of illegal immigrants. It merits rigorous attention as to how ‘migrant workers’ and ‘illegal immigrants’ are beginning to be mischievously used interchangeably. When the MoU by National Coalition of Organisations for Security of Migrant Workers (NCOSMW) with UIDAI was criticized, the proceedings of the first general body summit of the NCOSMW convened in Bhopal on 26th and 27 November 2010 hosted by Samarthan-Centre for Development Support admitted "One of the triggers for creation of the coalition was the UID project. There was a good overlap between the mandate of the coalition which sought a mobile identity for migrant workers and the work of the UID. However, the recent roll-out of the UID project has been ridden with controversies. In view of the recent developments, the Coalition felt the need for critical engagement with the UID Authority and not a blind endorsement of the project." Campaigners against UID project had written to them and some of their resource persons withdrew from it. Not only them even Bihar chief minister Nitish Kumar has revealed his position by launching biometric e-Shakti initiative in Bihar. It is turning Biharis into guinea pigs for biometric technology companies. In the name of ‘Financial Inclusion’, what is unfolding is surveillance of transactions, mobility and every aspect of life. The biometric data collection faces legal challenge in Supreme Court. The e-Shakti project was launched under National Rural Employment Guarantee Scheme (NREGA) Bihar on 24 February 2009 in Paliganj Block of Patna. More than 5 years and 7 months have passed since the project was launched. It is noteworthy that e-Shakti project was launched within a month of the creation of UIDAI, which was brought into its controversial existence on 28 January 2009 by a notification of the Planning Commission. While presenting the Union Budget 2009-10, the then Finance Minister, Pranab Mukherjee had announced the setting up of UIDAI to “establish an online data base with identity and biometric details of Indian residence and provide enrolment and verification services across the country” in paragraph no. 64 of his speech. It is this notification meant for biometric data collection which faces robust legal challenge in the Supreme Court. State governments must apply their legal minds to abandon biometric data collection the way it has been done in UK, USA, France, China and Australia before it is compelled by the Court to do so. There is a compelling logic to reject those parties which implicitly or explicitly support tracking, profiling, databasing and mortgaging of citizens’ rights and their sovereignty under the dictates of their donors and non-state actors. It is clear that Bihar being taken in that non-democratic route through such biometric identification. The multi-party Parliamentary Standing Committee (PSC) on Finance comprised of Yashwant Sinha, Shivkumar Udasi Chanabasappa, Jayant Chaudhary, Harishchandra Deoram Chavan, Bhakta Charan Das, Gurudas Dasgupta, Nishikant Dubey, Chandrakant Khaire, Bhartruhari Mahtab, Anjan Kumar Yadav M, Prem Das Rai, Dr Kavuru Sambasiva Rao, Rayapati S Rao, Magunta Sreenivasulu Reddy, Sarvey Sathyanarayana, GM Siddeswara, N Dharam Singh, Yashvir Singh, Manicka Tagore, R Thamaraiselvan, Dr M Thambidurai, SS Ahluwalia, Vijay Jawaharlal Darda, Piyush Goyal, Raashid Alvi, Moinul Hassan, Satish Chandra Misra, Mahendra Mohan, Dr Mahendra Prasad, Dr KVP Ramachandra Rao and Yogendra P Trivedi. Under the influence of biometric technology companies, Bihar Government is creating a situation where if you do not have the biometric smart card you may not get the right to have rights. The project in questions is being implemented by a consortium consisting of Smaarftech Technologies Pvt Ltd. Partners in the e-Shakti project include Bihar’s rural development department as the principal force behind the e-Shakti project, Bihar State Electronics Development Corp Ltd (BELTRON), a government of Bihar undertaking which is engaged in business related to Electronics and Computer technologies and services, and Infrastructure Leasing & Financial Services Ltd (IL&FS), a infrastructure development and finance company. Beltron and IL&FS have together formed a joint venture company, Bihar e-Governance Services and Technology (BeST), which is monitoring the e- Shakti project, which is being implemented by the service provider consortium. Smaarftech Technologies, a special purpose vehicle (SPV) of Glodyne Technoserve Ltd is implementing, managing & maintaining the NREGS-Bihar (e-Shakti Project) over a period of five years for the department of rural development, Bihar. Smaarftech Technologies is a subsidiary of Glodyne Technoserve Ltd. Glodyne Technoserve is a leading IT Services company, having a pan India and US presence, which has been partnering with various e-governance initiatives by providing its competencies in the IT Project Management Space. Dr Mahendra Prasad from JD-U is/was a member of the Parliamentary Standing Committee on Finance that rejected the Aadhaar project. Hence, the motivation for e-Shakti Project which is duplication of Aadhaar is inexplicable. On 22 October 2013, BJP vice president Smriti Irani said, “The reality is that the National Identification Authority of India Bill, 2010, which gives sanction to this particular card, was rejected by the Standing Committee on Finance”. Quite like CPI (M), TMC and JD (U), she failed to announce that since Aadhaar violates constitutional rights and has been rejected by the Parliamentary Standing Committee on Finance, BJP ruled states will not implement it and if her party comes to power it will scrap it. All claims of benefits from biometric identification are highly suspect. How can the recommendations of the Parliamentary Standing Committee on Finance that questioned government’s right to collect biometric data be ignored in West Bengal, Tamil Nadu, Bihar and in all the other states. The collection of sensitive biometric information is an assault on democratic rights of citizens. It is high time state governments desisted from doing so the way Barack Obama and 25 states of US opposed the REAL ID Act, 2005 and UK, Australia, China, France and European Court of Human Rights rejected indiscriminate collection of biometric data. registration of birth, marriage and death, employers (current, past and prospective), banks, credit card companies, insurance companies, telephone service provider, television service provider, internet service provider, internet services (email, video, social media, search engine, chat, voice, file-storage and transfer etc. ), registration at school/college, marriage bureaus, post-office and courier services, hospital registration and medical records, visa of US and UK etc. personnel since British rule till now, also for access and attendance now), Planning Commission of India (for access and attendance), census office (for compulsory NPR), Passport, RTO (for driving license), insurance companies, IT, BPO and healthcare companies (for access and attendance), visa of US and UK etc. Aadhaar does not violate any privacy or fundamental right. Looks like the PR of UIDAI is on a hit job. BTW...do you even understand, the basic issue in India is demand and supply gap. People are deprived the benefits not because of lack of identity but because middlemen rob the benefits meant for them. You and your UIDAI is just the new shady middleman, in this demand and supply scenario and nothing more!! Some privacy champions raise the privacy issue which is irrelevant in a poor country like India where about 750 million people starve for 2-square meal, where illiteracy is high, where religion & caste-based-bias continues, rampant corruption & exploitation exists. They forget that India has a law called Information Technology Act 2000. It has been existing since year 2000 that protects Aadhaar information along with other laws. Privacy issues & risks equally apply to data collected by census office, passport office (with biometric), driving license, PAN card, employers (current, past & prospective employers with or without biometric), schools, US & UK visa (with biometric) etc. 15. Ineligible people will not be able to misuse certificates of income, domicile and caste to deprive the eligibles. I hope ML does not become militant and use unethical means to stop aadhaar project. Agree with TIHARwale.... gone bonkers is the right word. LoL. Why nobody is filing CONTEMPT OF COURT suit against all these agencies demanding Adhar card? Besides the theoretical violation of citizen's privacy what other violation is pointed out against AADHAR by this article? The article is not focused. From the observation of the 'standing committee' it appears that they have a doubt (not certain - but only a doubt) whether the notification issued for the implementation of AADHAR is beyond the scope of subordinate legislation. author has gone bonkers. ML is wasting space to this man. what he is trying to prove. definitely pilferage will get reduced it cannot increase because AAdhaar is implemented. What is the answer to the question you asked in your article title? Why opposition ruled states are playing partner for biometric UID? I find many paragraphs describing how certain states have oppose Aadhaar? But that is not the core subject of the article. Is it a coincidence that Lyon, France based INTERPOL, world’s largest police organisation too has called for global electronic identity (e-ID) card system? Does this not constitute “illegitimate advances of the state” because the state is complicit in it? Increasingly biometrics and e-Identity co-exist. Capt P Raghu Raman, chief executive of National Intelligence Grid (NATGRID), Union Ministry of Home Affairs, says, "the NATGRID is not an organisation, but a tool". It simply routes “information from 21 data sources to 10 user agencies ... it is like a Google of such data sources." NATGRID will function as a central facilitation centre, to "data sources" such as banks and airlines, they are the Research and Analysis Wing (RAW), the Intelligence Bureau (IB), Central Bureau of Investigation (CBI), Financial Intelligence Unit (FIU), Central Board of Direct Taxes (CBDT), Directorate of Revenue Intelligence (DRI), Enforcement Directorate (ED), Narcotics Control Bureau (NCB), Central Board of Excise and Customs (CBEC) and the Directorate General of Central Excise Intelligence (DGCEI). These agencies will get access to information from NATGRID. Security agencies can seek the details from NATGRID database. Data from companies like airline and telecom would be uploaded to NATGRID database. All the security agencies will have an access to NATGRID. The fact is Central Identities Data Repository (CIDR) of Unique Identification (UID)/Aadhaar number and UID number generator National Population Register (NPR), Union Ministry of Home Affairs is a subset of NATGRID. When asked about the qualification of CEO of NATGRID, the process for appointment of CEO, names and headquarters of the companies and government entities from which the data would be uploaded in the NATGRID and the names of the various government agencies that would have an access with NATGRID database under RTI Act, the Home Ministry on 30 June 2011 replied, “NATGRID/MHA is out of purview of RTI Act, 2005 under Gazette Notification No. 306 dated 9 June 2011”. The first RTI application was filed on the 11 May 2011. Clearly, NATGRID was removed from the ambit of RTI Act after the application was filed. How can information be denied based on a notification which was an afterthought with retrospective effect? Notably, when asked whether Council of Union Ministers’ have got themselves enrolled for UID number, UIDAI denied the information under RTI application stating that it is third party information. There is nothing on record to show that the promoters of biometric identification like Pranab Mukherjee, LK Advani, Nandan Nilekani, P Chidambaram Sushil Kumar Shinde, Manmohan Singh, Sonia Gandhi, Rahul Gandhi or Jairam Ramesh have got themselves biometrically profiled. In fact, Jairam Ramesh reportedly is on record for his refusal for the same. Senior leadership of no political party except Narendra Modi has got themselves enrolled for such an exercise. Responding to the direction issued to the Union of India and Union Territory of Chandigarh by Punjab and Haryana High Court in the matter of Civil Writ Petition 569 of 2013 filed in the High Court against Union of India and others, the Executive Order for making Unique Identification (UID)/Aadhaar has been withdrawn. In its order the bench of Chief Justice AK Sikri, and Justice Rakesh Kumar Jain dated 19 February 2013 had not noted that the petition “raises a pure question of law.” Since the Executive Order was withdrawn, the case too was disposed of 2 March 2013 with a two page order. It is quite bizarre that Union Territory of Chandigarh remains ignorant of the fact that UID is not a card, it is a 12-digit number. The entire government machinery is hiding the fact that fundamentally UID is not a proof of identity, it is an identifier contained in the Central Identities Data Repository (CIDR) of UID numbers. Union Territory of Chandigarh failed to inform the Court the UID is not a card but an identification number based on biometric data without any legal mandate. i) Issue a writ in the nature of certiorari to quash Executive order dated 5 December 2012 passed by respondent no.3 passed in violation of Motor Vehicles Act, 1988 and Central Motor Vehicle Rules, 1989 vide which UID has been mandatory for the registration of vehicles and grant of learner/ regular driving license. iv) a writ in the nature of certiorari quashing notification dated 28 January 2009 being illegal and further issuance of a appropriate writ declaring the Unique Identification Authority of India constituted vide Notification dated 28 January 2009 unconstitutional as the same has no legal sanctity as the UIDAI been constituted and functioning illegally. The writ petition had emphasised that during the pendency of the petition, Executive order dated 5 December 2012 and other similar executive orders vide which Aadhaar have been made compulsory for essential public utility services may kindly be stayed. It is noteworthy that Indian National Congress led Government’s budget speech of 2013 announced that “We are redoubling our efforts to ensure that the digitized beneficiary lists are available; that a bank account is opened for each beneficiary; and that the bank account is seeded with Aadhaar in due course.” In the light of the Punjab & Haryana High Court’s order, the implementation of opening of bank accounts seeded with UID/Aadhaar is legally and constitutionally questionable. By it is somewhat well known that UID number and UID number generating NPR is based on biometric and retinal profile procured from Indians. This is the most repulsive aspect of the project. Any biometric profile directly violates the very dignity and privacy of Indians which is guaranteed by the Indian Constitution. What is normally used for terrorists and criminals is now sought to be used against the common citizens of this country. Does it mean that the state has lost confidence in its people and wants a criminal profile of all its citizens? Can there be a more shameful aspect of the state intrusion into individual privacy? Supreme Court’s judgement dated 4 July 2011 upheld Right to Privacy as Right to Life. Disregarding this, the government seems to be acting under the influence of surveillance technology companies and biometric technology companies. Take the case of RS Sharma, who in his role as director general of Government of India’s UIDAI (who is currently the chief secretary of Jharkhand) is rare person because he biometrically profiled Bhartiya Janata Party’s Prime Ministerial candidate. On 1 May 2012, Sharma “took the biometric fingerprints of Mr Modi for his identity card and registered him under the project” as per the website of Narendra Modi. (Source: http://www.narendramodi.in/cm-kicks-off-uid-project-in-gujarat/ ). As chief secretary of Jharkhand, he has committed a manifest act of contempt of Supreme Court by letting his principal secretary, Department of Human Resource Development to issue an appeal in the Patna edition of The Times of India asking all the schools including those which are non-governmental and unrecognized to mandatorily submit “Aadhaar card” to the school. While this is in violation Court’s order of 23 September 2013, it is noteworthy that Sharma allowed his subordinate official to refer to biometric Aadhaar number as “Aadhaar card” despite his involvement with UIDAI. Hopefully, the Court will take him to task for his temerity. Does the BJP’s prime ministerial candidate know that neither Congress’s prime minister nor its undeclared prime ministerial candidate have been biometrically profiled so far? It appears that he was taken for a ride but he must explain as to why he subjected himself to the ignominy of being biometrically profiled. The statement of concern on UID number issued on 28 September 2010 a day ahead of the launch of the UID number Sonia Gandhi and the prime minister by the eminent citizens including former judges, jurists, educationists aptly stated, “there is a fundamental risk to civil liberties” and sought the halting of the project. Now who else is required to convince Indians in general and non-Congress parties in particular that there is no excuse to postpone call for boycott and civil disobedience movement against biometric identification in any form. So the blogger believes that snooping / surveillance cannot be done without Aadhaar. He should study topics well. How Narendra Modi did the snooping of a girl in 2009 without Aadhaar? Intention of powerful matters a lot! Showing your true intentions? What the alleged snooping has to do with Aadhaar? Get well soon from this Modifobia!! I recall BJP campaigning for National Identity Card (advocacy by Advani & Bajpai) about 20 years ago on the lines of SSN of USA. Purpose was same as Aadhaar i.e. to bring transparency for checking Retail-corruption as well as identifying & tracking illegal migrants. However, when BJP came to power, they forgot it completely. BJP did nothing, literally nothing on Identification program because most of the PDS shops, Kerosene, LPG etc. are owned by BJP partymen. Thus BJP lost the lifetime opportunity to bring relief from retail-corruption to the general public. And now the cronies are having unsuccessful disinformation campaign to subvert Aadhaar. That way Congress is no less. About 90% congressmen do not want Aadhaar to succeed, yet they keep quite due to fear of Sonia. The main political forces to drive Aadhaar programs are Sonia Gandhi, Manmohan Singh, Shiela Dixit and few more in order to make success of NREGA, Food Security welfare programs etc. The nation will remain grateful to Sonia et al because this is the single powerful governance tool devised post British-rule to weed out the Retail-corruption and bring transparency & efficiency in public administration thru e-governance. Aadhaar enabled Service Delivery (AeSD) will positively transform India. As a public stakeholder I say that Sonia et al will deserve Bharat Ratna, if & only if they succeed in implementation of Aadhaar-enabling all government services within 3 years (note: Not for 1200 million Aadhaar registration). That means Aadhaar-enabling of attendance of all government offices (on the lines of Planning Commission) and all the public services e.g. Vote-cast, Registration of property, company, marriage, birth & death, RTO services, Passport services etc. Sonia should accept this as her KRA set by public if she returns to power in 2014. Else Naredra Modi should regain the lost opportunity of BJP. Either way, general public will be the winner; and soon India will stand in the club of developed nations! The problem with so-called intellectuals like you and Nilekani is seating in an AC officer you do not know what actually takes place on the ground. Here are the basic differences between NID proposed by Vajpayee and the UID of Nilekani..
1. NID was not based on biometric profiling. 2. NID was meant only for citizens of this country unlike UID that can be procured by anyone residing in India. Narendra Modi is a big supporter of anti-corruption tool Aadhaar. He has enrolled himself, and the photos are available at UIDAI website. He also requested that Gujarat be given high priority to Aadhaar enrollment. As an astute & visionary Administrator, NaMo has perfectly understood the enormous power of this simple governance tool. It will help Government in Planning & Execution of Public Welfare programs effectively, efficiently, transparently and conveniently. So even if the Government at the Centre changes, Aadhaar is here to stay! However, will the BJP party-men allow Modi to link all public databases with Aadhaar Number – like PDS, LPG, Kerosene, all Bank A/c, Company registrations etc? No, because majority of such shops are owned by BJP party-men, who will not be able to carry on with Retail-corruption, benami land deals, benami bank a/c & benami companies for accepting bribe-money & money-laundering activities (live example Nitin Gadkar, ex-president of BJP). Otherwise also, Aadhaar registration (about 550 million enrolled, 500 million issued as of Nov-2013) and Aadhaar Enabled Service Deliveries (LPG, Bank A/c, PDS, Kerosene, Pensions, Scholarship etc.) have crossed the critical-mass, hence it is not reversible by any pro-corrupt force. BTW...how many Congress CMs and leaders have enrolled for Aadhaar? Or they are not interested like party chief? Although Narendra Modi is personally in favor of Aadhaar yet BJP partymen may not allow him to proceed because they are the beneficiaries of such corrupt-practices. Most of the PDS shops, LPG dealerships are owned by BJP. Who are most scared of Aadhaar? Yes, we the common people are thieves and terrorists and thats why you are hell bound to get our fingerprints and IRIS scan, like how Police or investigation agencies from the British era to modern day collect such data from criminals? Come on... we the common people are not fools to fall prey to your marketing gimmick! Election Commission should make Aadhaar mandatory to contest all elections - from Gram Panchayat to Parliament. Your suggestion would, however, deprive your party chief, the gen secretary and incumbent PM out of the frame as they dont have Aadhaar!! About Rs. 35 billion (Rs.3,500 crore) has been spent totally on Aadhaar program from beginning (January-2009) till September-2013 with enrollment of 500 million (50 crore) persons. It includes operating costs as well as capital expenditure (infrastructure of land, building, machinery). Government informed the Parliament in August-2013 that the total sanctioned cost of UIDAI (including cost of permanent infrastructure like land, buildings, computers, software etc.) is Rs.123 billion (Rs. 12, 398 crore) for assigning 1.25 billion Aadhaar numbers. Thus at the end the unit cost will be about Rs.100 per Aadhaar. The projected cost and benefit analysis report by National Institute of Public Finance and Policy shows that Aadhaar-enabled public welfare programs will be able to save Rs. 1.1 Trillion (Rs. 110,000 crore) by the year 2020.
International Monetary Fund (IMF) has projected that Aadhaar-DBT will save 0.5% of GDP from corruption. applicable to entire country. Similarly, 2/3rd of subsidized Kerosene has been saved from bogus beneficiaries in one block in Rajasthan. Prime MInister's Office (PMO) should follow Planning Commission office i.e. Aadhaar-enabled access and attendance system. It will be lead by example by PMO. This would lock out the PM himself from his office!...BTW...Has MMS enrolled for the UID till date? Planning Commission office is Aadhaar-enabled access and attendance system. Nandan Nilekani uses his Aadhaar to enter office. Biometric data based 12 digit unique identification (UID)/aadhaar number can be misused in the same way as IBM's census data was misused by the Nazi party. One can refer to the book 'IBM and the Holocaust' by Edwin Black to know more. Who can prevent genocide using aadhaar number? Opponents believe that snooping / surveillance cannot be done without Aadhaar. Then how Narendra Modi did the snooping of a girl in 2009 when Aadhaar did not exist? Intention of powerful matters a lot! Biometric data based 12 digit unique identification (UID)/aadhaar number can be misused in the same as IBM's census data was misused by the Nazi party. One can refer to the book 'IBM and the Holocaust' by Edwin Black to know more. Who can prevent genocide using aadhaar number? Krishna, you are not right to compare with IBM data. Why should Amul Babies be bio metrically profiled? There goes the Winter Session of Parliament. The BJP has demanded that Prime Minister Manmohan Singh must resign over biometric profiling of Shri Narendra Modi for Aadhar Card, or else they'll not allow Parliament to function. They have demanded that a JPC be constituted to go into all aspects of the conspiracy to endanger the life of Shri Narendra Modi. Subramaniam Swamy has alleged that it's an undercover operation by the Italian Secret Service, to make Modi ji vulnerable to terrorist attacks by making it easier for terrorists to recognize him from a distance through biometrics. He has said that he'll soon sue Chidambaram for it. IndiaNews, a Hindi TV news channel has unearthed a scam where anyone can buy Aadhaar or the unique identity number by paying just Rs500. According to a sting operation carried out by the channel in Noida, one person Samir (who is allegedly an employee of Smart Chip Ltd) used to provide Aadhaar letter without taking any proof from the applicant. The report says Samir was issuing Aadhaar letters to even non-Indians on payment of Rs500 or more. As per Unique Identification Authority of India (UIDAI) the person enrolling for its UID number scheme, has to either submit proof of identity (POI) or address (POA), date of birth and proof of residence (POR). This however, can be sidelined as UIDAI says "Resident who does not have POI and POA may get enrolled through an Introducer/ Head of Family". IndiaNews is run by Kartikeya Sharma, who recently bought News X and The Sunday Guardian. No individual can issue an Aadhaar letter. 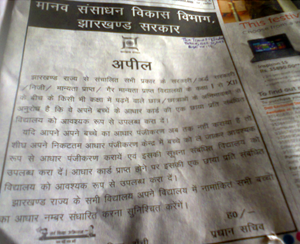 It is issued by UIDAI. Seems like there is a lot of hearsay in this report and hardly anything concrete. Aadhaar letter and Aadhaar enrollment letter are 2 different things. You seem to know the thing well. What are the cross-checks in the system. Does it have a record who can be held responsible for bypassing the documents or accepting unverified documents. What punishments can be imposed on such persons. How long could it take. Which authorities, government or out-sourced organization are responsible. I feel it a good scheme to be able to identify each and every person. The bad thing is there is no distinction between Indian Citizen and outsiders. Once a person gets Aadhar Card, he has access everything in India, such as Pan Card, Bank Account, Proof of Residence, Proof of Identity, Gas Registration, Election Card and may be Passport too. Bharatmata Ki Jai. ?? Dear Vaidya - Cross checks to the best of my knowledge (based on all info provided on Aadhaar web-site) include various demographic data check which includes automated and manual checks, biometric data check again automated and manual (if automated returns a result which requires manual check of the enrollment packet)and then it goes on for a few other checks before which it is processed for Aadhaar number. These are some of the many other reasons why it takes 60-90 days for an Aadhaar applicant to know whether his application has been accepted or rejected. Yes, while there is still doubt on whether it can be given to any resident who has been in India for more than 6 months, at the end of the day, every resident would be identified by their biometrics. Jai hind. This is a good program if operated and managed in the spirits it was meant for and for any political purpose.